Finally! Direct from the Infinity Seminar at FicZone. Follow along THIS THREAD in the Infinity Forums to see all the new pictures and announcements. Thank you for joining us for the first episode of MayaCast! This first episode lacks the bells and whistles – and structure! – that future episode will have, but we got our feet wet, and will learn from every mistake – and, of course, your feedback! Shut up and take my money already! – You would buy this model just to own it, even if it would never hit the table. If you played the faction, multiples would be in order even if you cannot play multiples. A crown jewel of the Infinity line of figures. That’s what I’m talking about! – Gorgeous model that is doing something new. 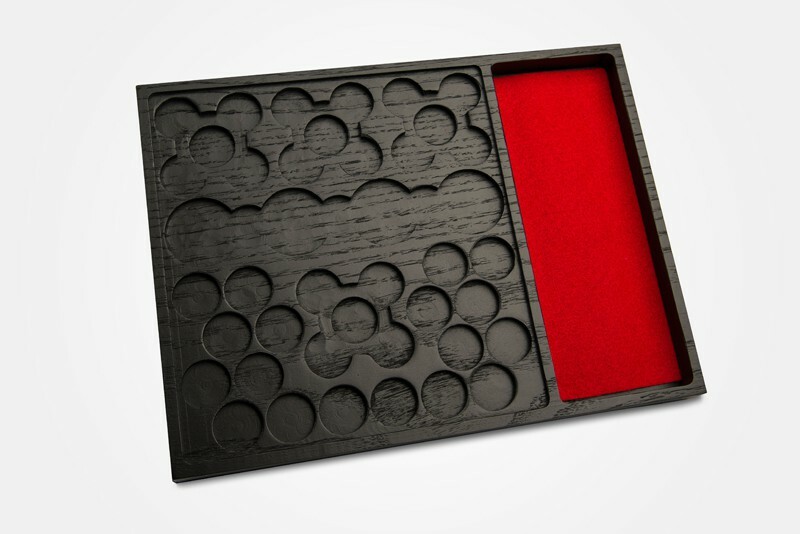 A must own for a faction you play. Cannot wait to get your hands on it. Standards, you’ve got to have standards. – They hit their usual stride with this sculpt. Imaginative, neat, and asking for paint. It’s good enough to play – The model is nice and average. Only if I have to, and even then…. – You don’t care for the sculpt and would only get it if you played the faction and couldn’t do without it. 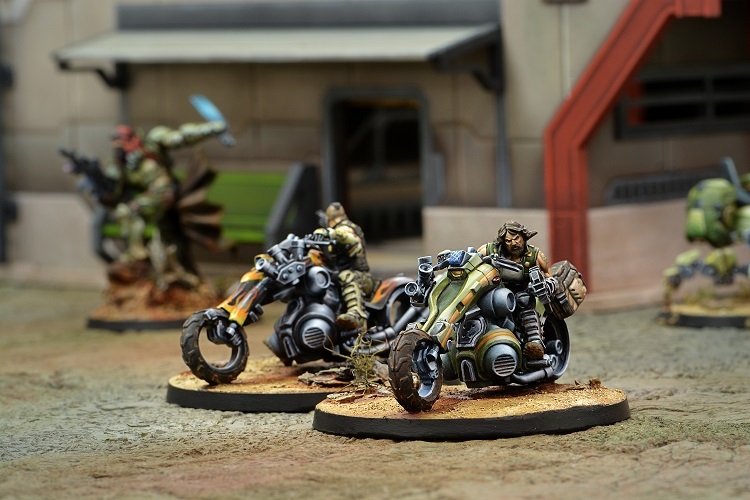 Kum Bikers – 55mm Bases! 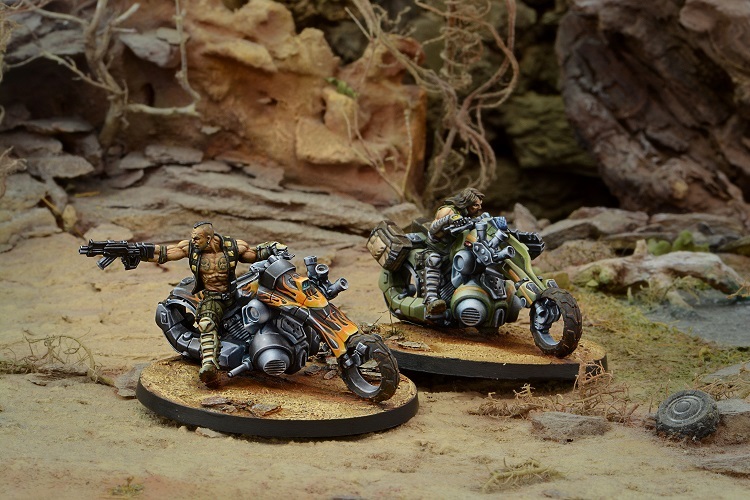 The release of these models broke the Official Infinity Forums! I think that they are gorgeous! And look, that’s a new 55mm base! Base extensions (like on many TAGs) may be a thing of the past! 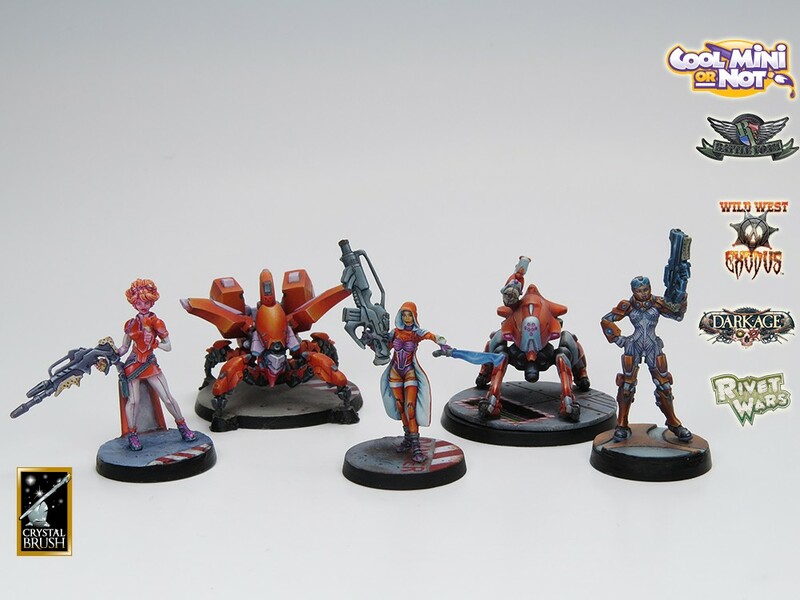 Angel Giraldez, Infinity Staff Painter, has posted a preview of the new Neoterra Bolts box on his YouTube channel. Check it out here, and while you’re there why not subscribe to his channel? Adepticon 2014 was held at the Westin hotel in Lombard, IL (a suburb of Chicago) this weekend. They great team running things there had 20 tables all set up with terrain, ready for Infinity gaming – and they still had more terrain in tubs underneath the tables! While no single event reached the 40 players that they were prepared for, they saw a lot of action all weekend long. The Demo table was going non-stop with new players trying out Infinity for the first time using the army lists from the Quick Start rules, on a great table of Warsenal terrain. There was a major Infinity Tournament each day. Thursday night was a Spec Ops Campaign event, where you built your Spec Ops model after each round with the Objective Points you achieved. 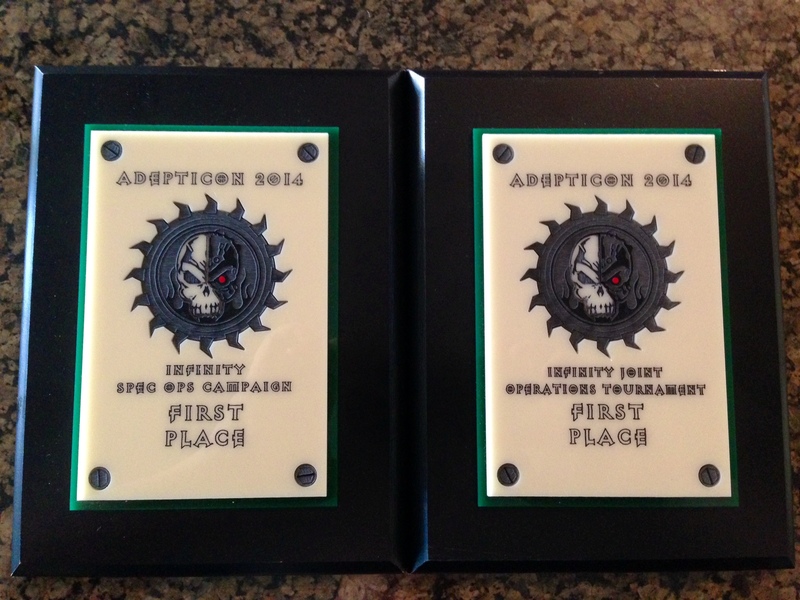 Friday was a Joint Operation team tournament during the day, followed by a 400-point Annihilation tournament that night. All day Saturday was the Grand Tournament, and Sunday was a special event using spec-ops models to escape a Morat prison. 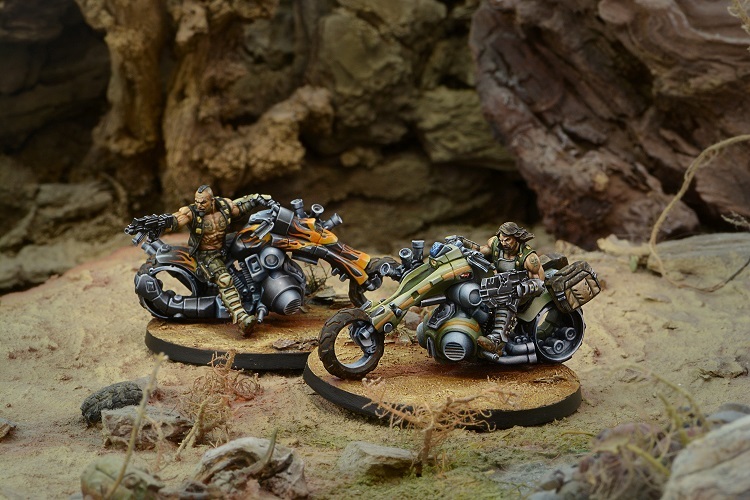 Tom from MayaCast won the Spec Ops campaign tournament on Thursday with his Tohaa, and then teamed up with J from Warsenal for the Joint Operations tournament, where their Team Tohaa 10 took the top prize. Tom then entered those same Tohaa into the Crystal Brush on Saturday, rather than play in the Grand Tournament. They ended up walking away with the top prize in Sci-Fi Squad as well! 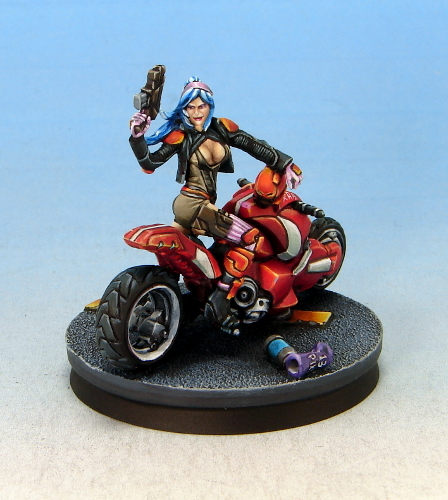 In addition to the Tohaa, Asuka Kisaragi also earned a Bronze Crystal Brush in the Sci Fi Vehicle category. Friend of the Podcast Guillermo (you may know him as the legendary “Magno”) also scored a Crystal Brush for his Nomads, “Team Creamsicle. The weekend ended with a bang Saturday night when Kip’s Aleph Steel Phalanx faced off against Bill from Warsenal, playing Kip’s Caledonians. The Myrmidon Hacker killed seven Caledonians, making 9 armor saves along the way! It seemed that every time Bill would roll a Crit, Kip would out-crit him! It happened twice, once when Bill had rolled TWO crits, and again on the last roll of the game. Entertaining stuff! Welcome to the home of MayaCast – An Infinity: The Game fan podcast by hosts Tom Schadle and Kip Parcell. Many of you will remember us from the O-12 podcast. Tom has disassociated himself with Romeo Filip, so obviously could no longer continue doing that podcast. Instead, we intend to re-start our podcasting efforts here. The mission of MayaCast is to grow the Infinity: The Game Community. 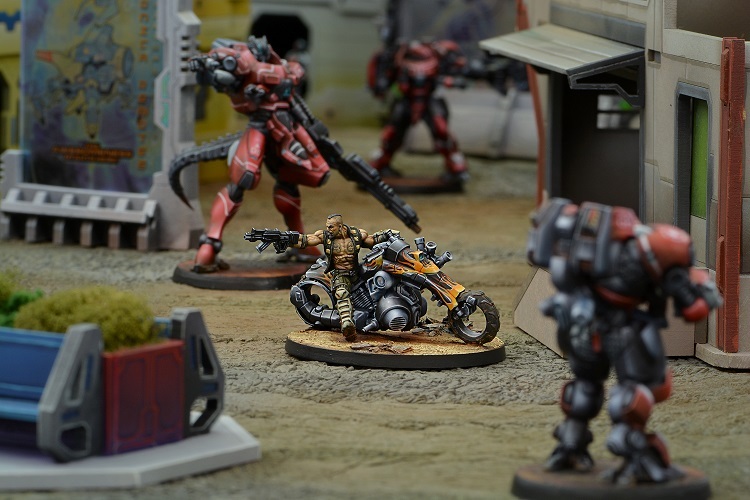 We are fans of the game, the background, the models, and the staff of Corvus Belli themselves, and want to share our love and enthusiasm for this fantastic table top 28mm miniatures wargame, set 175 years in the future. It may take us awhile to get started, and we certainly won’t be as polished at first without the use of the corporate, professional sound studio at Battle Foam. But we will do our best, continue bringing the content and banner you’ve come to expect, and will grow and improve with each episode. The best part is that we will be free from any corporate constraints, and until we get our own advertisers (if ever), you won’t have to hear any shilling or advertisements! This will be 100% by us, for you, in support of our friends at Corvus. Not for any hope of monetary gain, or to push a product – but simply for the love of Infinity.